Kit, Fording, deep water. Includes exhaust and intake related parts less common screws, nuts and bolts. Kit has proper heavy wire reinforced breather hose. if all hardware in needed add $30.00 to standard price. ***Please note that the shipping estimate will be off. There will be two boxes for this kit. Kit, Fording, deep water. 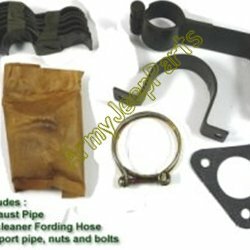 Includes exhaust and intake related parts plus screws, nuts and bolts. Kit has proper heavy wire reinforced breather hose. All parts are included except the following: fording valves, fording cable and cable brackets. ***Please note that the shipping estimate will be off. There will be two boxes for this kit.